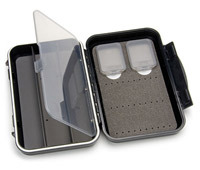 These much requested Tube Fly cases feature several upgrades over the well proven CF1401 Case. More storage capcity (with a choice of models for different sized tubes) separate containers for tubing, cones etc and of course the fully watertight medium shell. 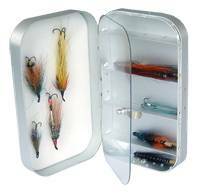 A Tube Fly Box based on Snowbee's Waterproof body moulding, but featuring open compartments both sides, to hold a full range of tube flies, trebles, Waddington Shanks etc., in one neat box. 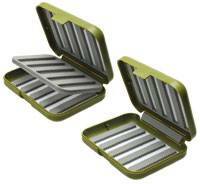 7 compartments one side, including 2 full length compartments for long tube flies and 9 smaller compartments the other. 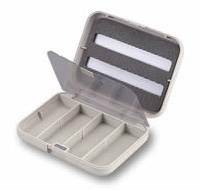 6.1" x 3.9" x 1.7"
Our range of Tube fly boxes hold tube flies securely without damaging the dressings. 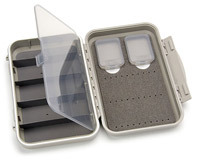 A choice of foam, foam sockets, clips and compartments are available to house both tubes and trebles. Flies not included.